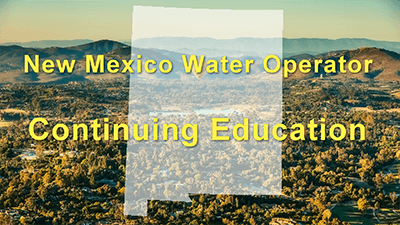 The continuing education courses for water operators in New Mexico that are presented here on AYPO Tech are designed by experts to provide training that is practical, comprehensive, and insightful. Each course is approved by the state of New Mexico, and qualifies as continuing education units (CEUs) that can be used to fulfil your continuing education requirements in order to renew your certifications. What are the CE requirements for New Mexico water operators? Licensees must complete their CE requirements every 3 years in order to renew. Renewals are done on a continuous basis according to the licensee's birthday. A 10 Hour CE Package Includes: Surface Water (3 Hours), Corrosion (3 Hours), Oxidation (2 Hours), and Membrane Processes (2 Hours). Mark: Your Classes are approved in New Mexico. When submitting training hours please use the attached sheet for each class submitted. Do not worry about the reference # we put that in. Let me know if you have any other questions.